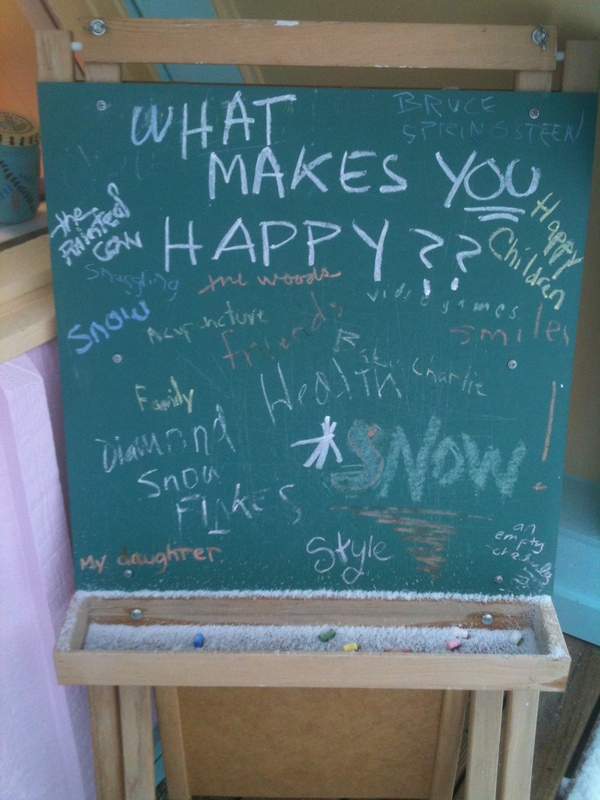 “What makes YOU happy?” That’s the question I have on a chalkboard by the entrance to The Happiness Paradigm. Everyone who stops by is invited to write their own answers. I occasionally step outside and add something myself. I confess, I was the one who wrote “Bruce Springsteen,” after listening to his totally happy version of Santa Claus Is Coming to Town. I also lead “Happiness Circles,” where we discuss the same question. Naturally, in that context, the answers are more nuanced and less light-hearted. No matter the forum, “family,” “friends,” and “pets” crop up frequently. 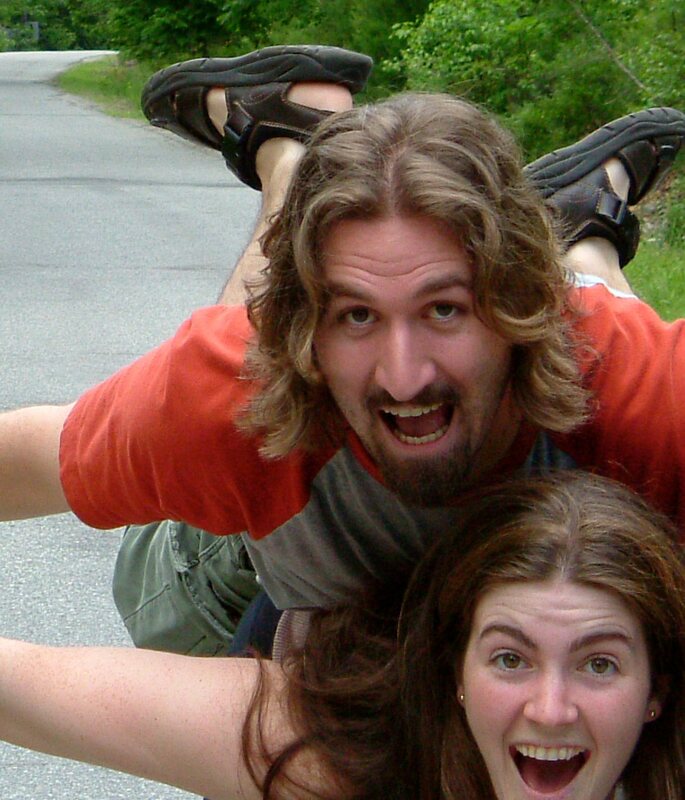 (See the “What Makes You Happy” page on this website for a complete list). Such answers resonate with me. Some answers, though, give me pause — “style,” “video games,” and “money” — because they don’t fit neatly into my view of happiness as influenced by Positive Psychology and Gross National Happiness research. Obviously, happiness at the individual level is universal, unique, and complex! I suspect the same is true at the state level; many answers I’ve collected have a Vermont-specific focus. A lot of people here answer “snow” — a choice that probably wouldn’t show up at all in most southern states. This universality/uniqueness balancing act no doubt applies even at the national level. Bhutan, the first country to put theoretical GNH concepts to work, has conducted a great deal of detailed research, for which the rest of the world should be grateful. Researchers there developed a measurement system of 72 indicators within nine pillars of happiness: psychological well being, standard of living, time use, good governance, health, education, community vitality, and cultural diversity and resilience. http://www.grossnationalhappiness.com/ These pillars and indicators are an amazing foundation for other governments to build on. But are all the Bhutanese findings appropriate to policy making in the U.S.? In Vermont? In Seattle? We need to do our own homework. And when we do our homework — for personal, political and/or professional reasons — we need to investigate a variety of sources and schools of thought. A recent blog from the Seattle-based Happiness Initiative, happycounts.blogspot.com, illustrated this point with an essay on the restrictive nature of Positive Psychology formulas. Interesting. I find that Positive Psychology theories do, for the most part, encompass responses on my chalkboard. The Positive Psychology categories are BIG, certainly, while individual perspectives are more textured and colorful. But they still seem to fit. Chocolate, red wine, Bruce Springsteen and toes in the sand all relate to savoring. Pets, cousins, and friends? Connections. Singing in the choir — a very happy experience for me — fits in multiple categories: giving to others, being in the creative flow, lifelong learning, building community, nurturing spirituality, and even, a little bit, being physically active. Where Positive Psychology falls short for me is its lack of emphasis on the environment. In November 2010, I attended an otherwise wonderful seminar on happiness from a psychological viewpoint, but there was NO connection with the planet. Yet many people tell me what makes them happy is weather related, especially sunshine and snow. Or nature related, like walking in the woods. With Climate Change, the importance of environmental factors is bound to increase. I imagine folks living in areas subject to fires and droughts might answer that rain would make them very happy indeed. Fortunately, other sources do talk about weather and nature. For example, Dan Buettner‘s book Thrive posits that sunshine can definitely be a factor for community-wide happiness. Another example is the New Economics Foundation‘s “Happy Planet Index,” which blends carbon footprint considerations with more traditional gauges of societal well being to measure national well being.